With summer here, we should celebrate all things sun, fun and sea! 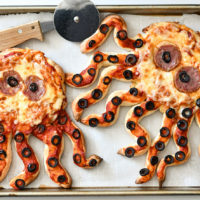 And what better way to bring the ocean to life than by making these Octopus Pizzas with your kids at home. 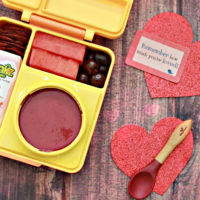 Not only are they a creative lunch option, but they also come with a lesson. You can talk about the sea: what creatures live in it, and how we can be good care takers while we make them. Now that is what we call eating with purpose! 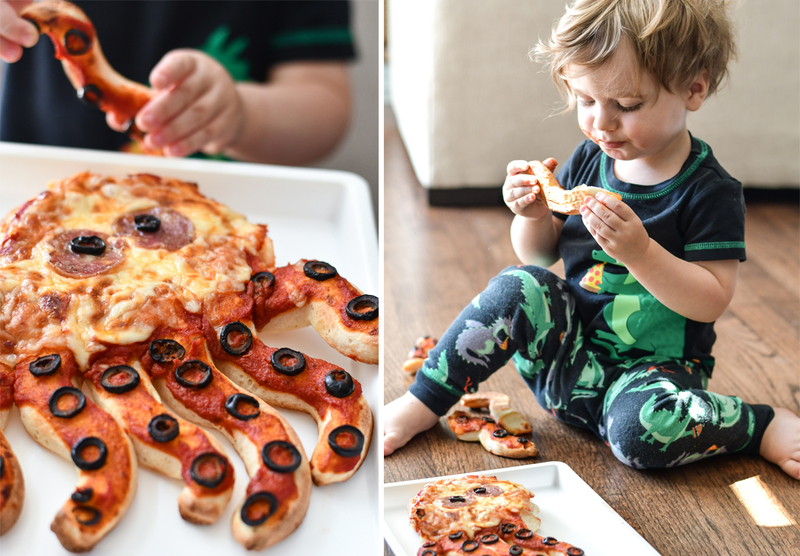 The best part of these Octopus Pizzas is how easy the tentacles snap off, especially for a toddler. 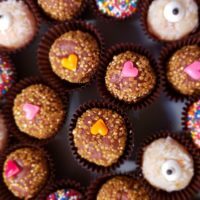 Kids will love ripping each one of them off and nibbling on them individually. Divide the dough in half. Each half will make 1 octopus. Divide the dough again. Shape half of that dough with your hands into an oval shaped for the octopus head. Using the other half, cut into 8 strips for the tentacles. Place the dough head on one of the baking sheets. Place the tentacle pieces along the bottom half of the head, gently firming the dough down. 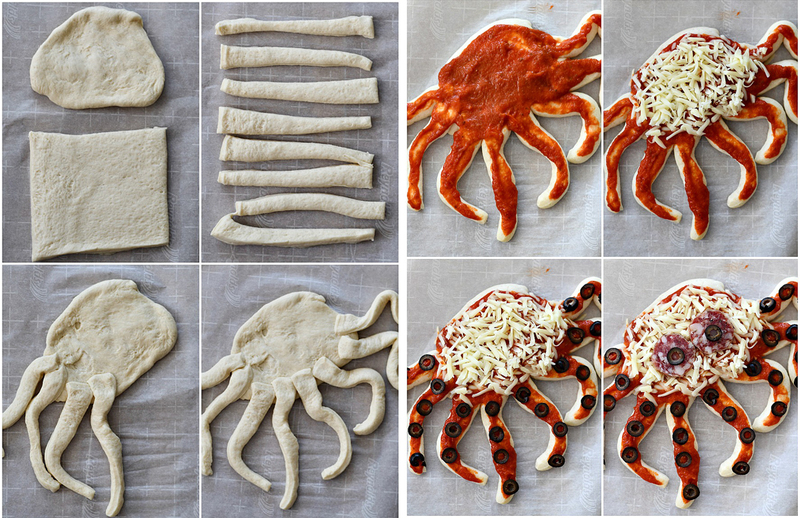 Remove and cover the head and tentacles with pizza sauce. 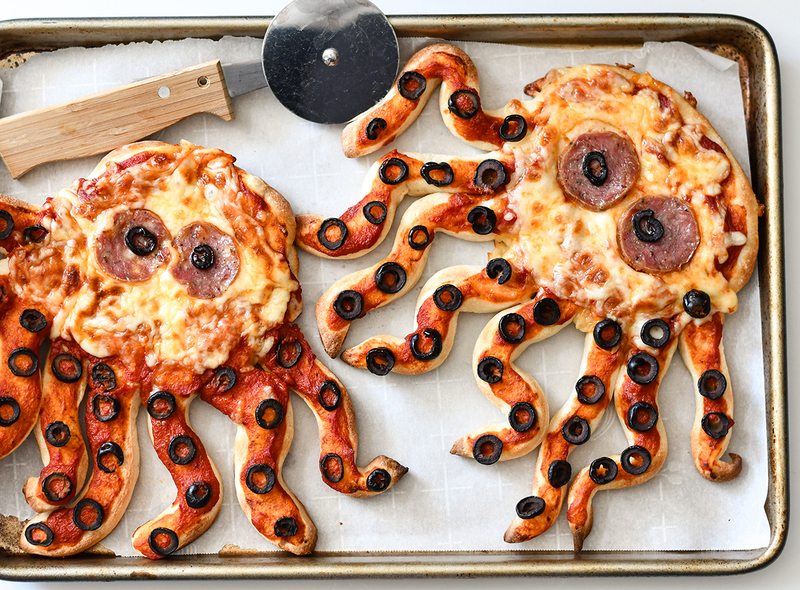 Spread out the cheese evenly on the head and place the sliced olives on the tentacles. Add the pepperoni and olive eyes. Bake another 6 minutes and then broil for 3 minutes or until nice and brown. Repeat for the second octopus. Follow us on Twitter, Instagram and Facebook, and hashtag your creations with #SuperSimpleOfficial.